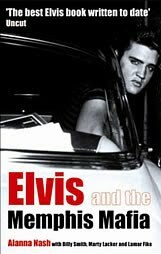 Elvis Today: "Elvis And I Laughed A Lot"
"Elvis And I Laughed A Lot"
Learning yesterday that Lamar Fike has passed away, I decided to read a bit in the book Elvis and the Memphis Mafia, the 2005 re-issue of Elvis Aaron Presley: Revelations of the Memphis Mafia from 1995. Lamar Fike wrote it together with Marty Lacker, Billy Smith and Alanna Nash in 1995. I had a very left-handed sort of humor, and Elvis always thought I was funny, even when I didn't mean to be. I got that from my mother. She just died in '94. She always used to say, "Have me cremated, Lamar. Just don't let me close to a vacuum cleaner." So I look at things with a pretty jaundiced eye. Elvis and I laughed a lot. For better or worse, we are what he [Elvis] left behind. He lives through his music, but he also lives through us. Now another one of Elvis' friends is gone. I'm glad he shared his memories with us. His story helps me fit a couple of more pieces together from the the giant jigsaw puzzle that is Elvis Presley. FTD's Classic Album Series: What's Left? "Everyone Does Enjoy Hearing You Sing"